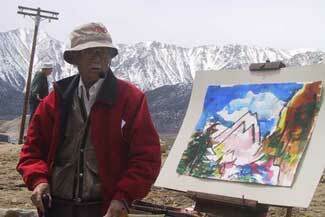 The Manzanar War Relocation Camp in the eastern Sierra has been the subject of many of the artist's paintings. 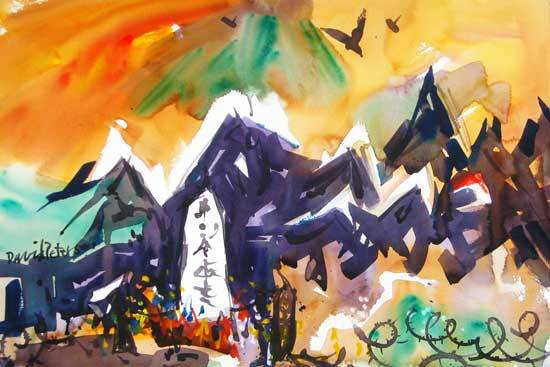 David was introduced to the subject by former internee and Watercolor legend, Henry Fukuhara. David has attended 6 of the Henry Fukuhara Manzanar Workshops that have been held at Manzanar. The workshops continue on after Henry's passing. Click on the thumbnail to view a larger image of one of the artist's Manzanar paintings from 2004-2009. Good-bye Henry. Photo: April 30, 2005, Alabama Hills. Obit here. LA Times obit here.